An old Ukranian proverb forewarns, “A tale that begins with a beet will end with the devil.” As a big beet fan, I’d like to think that a tale that begins with a beet will end with deliciousness. My cooking style has changed considerably since my baby boy arrived in November. Meals are simple, quick, freezable, and lunch-packable. Sundays are filled with food prep to make the work-and-baby-filled weeks a little easier. This Sunday I prepped muesli for breakfasts, grains, tofu, and greens for lunches, and snacks for the whole week. As a nursing mom, I need to make sure I’m eating small, healthy snacks in the mid-morning and mid-afternoon and hummus is a clear winner. Hummus is packed with protein and fiber, easy to make, and endlessly versatile (spread on crackers or in a sandwich, use as a dip with carrot sticks or sugar snap peas or put a dollop on a grain salad). Sometimes I get stuck in a rut with a basic hummus recipe but last month’s Cooking Light magazine inspired me to get a little crazy with my hummus and the results were great. I switched things up a bit from the original recipe. Cooking Light simplifies their recipe by microwaving their beet in parchment paper but I loved the depth that roasting the beet lent to the dip. They top their beet hummus with blue cheese, walnuts, and microgreens but I used what I had on hand: goat cheese, cilantro, walnuts, and a drizzle of lemon-infused olive oil. For more hummus inspiration, check out Cooking Light’s slideshow of creative hummus recipes. Combine tahini, lemon juice, olive oil, chickpeas, water, and garlic clove in the bowl of a food processor. Wrap beet in tin foil. Bake at 350° for 30-45 minutes until you are able to pierce the beet with a fork. Let stand 5 minutes; quarter beet. Add beet, honey, salt, and black pepper to food processor with chickpea mixture; process until smooth. 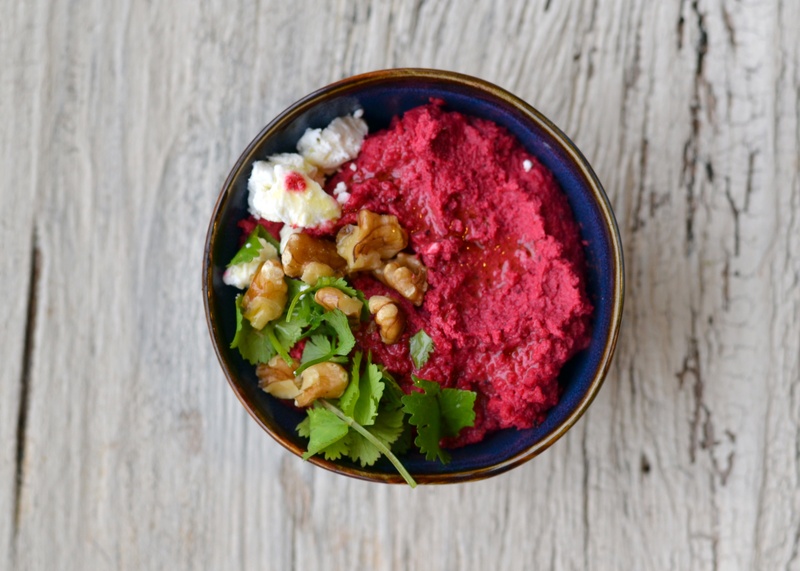 Top hummus with goat cheese or blue cheese, walnuts, and herbs. 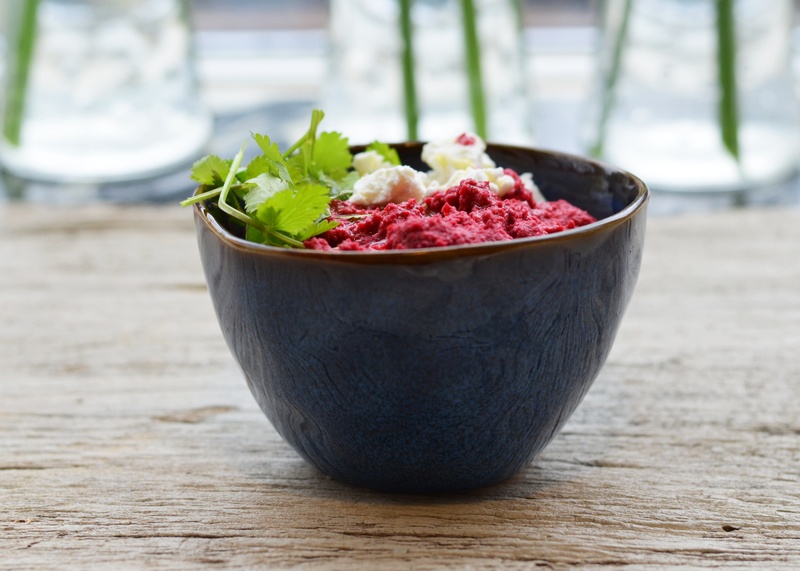 I love roasted beets and am dazzled by the idea of using them in hummus! Cannot wait to try this, Aura! Hi Dee. I’m so sorry that I missed your comment! Thanks for reading the blog. For this recipe, Cooking Light Magazine estimates that for every 3 tablespoons it is 87 calories, 4.8 grams of fat, 1.1 grams of sat fat, and 181 mg of salt. I hope that helps!